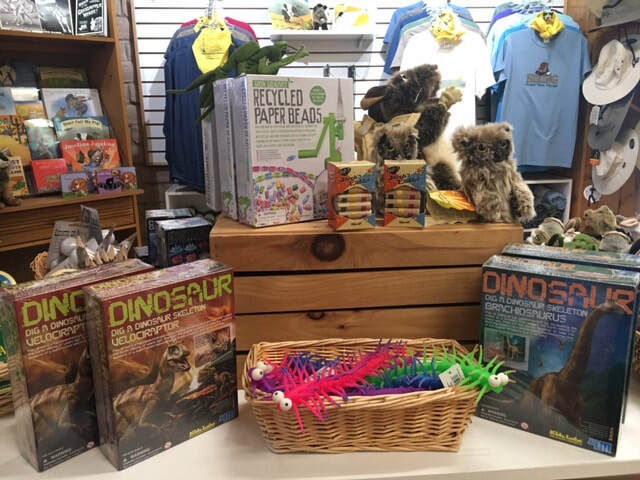 The Chihuahuan Desert Nature Center Gift Shop has a variety of fun items, from gifts for children to literature about the region, and much more! 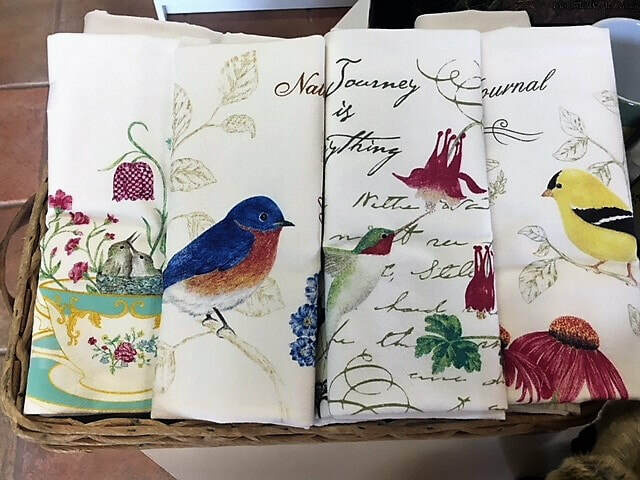 There are featured gift items made by local artists and craftsmen, lots of nature-themed items such as painted glass birdbaths and sotol walking sticks, collectible pewter horned lizard items, prickly pear jelly and honey, along with our agave syrup, Big Bend Roasters "Take a Hike" special blend coffee, handmade soap, and beautiful printed flour sack dish towels. 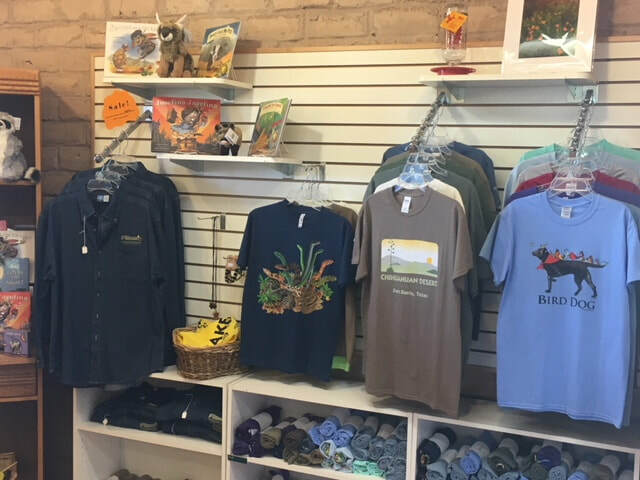 Be sure to check out all of the newly designed Chihuahuan Desert Nature Center t-shirts, caps, tote bags, bandanas,patches and lip balm. Our most recent additions to the Gift Shop are the stainless steel water bottles and the insulated travel coffee mugs -- also with the CDRI logo. 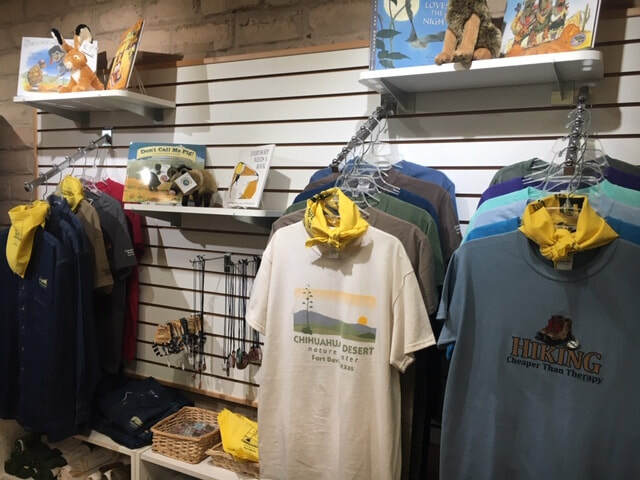 Our nature-focused bookstore is one of the best in the region. 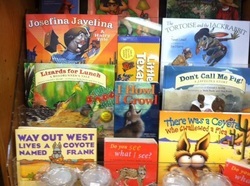 And our thoughtfully selected children's books, along with our javelina, jackrabbit, and coyote plush, and unique toys are second to none. Members and volunteers enjoy a discount of 10% throughout the year. Please contact us at 432-364-2499 for more information or for prices. 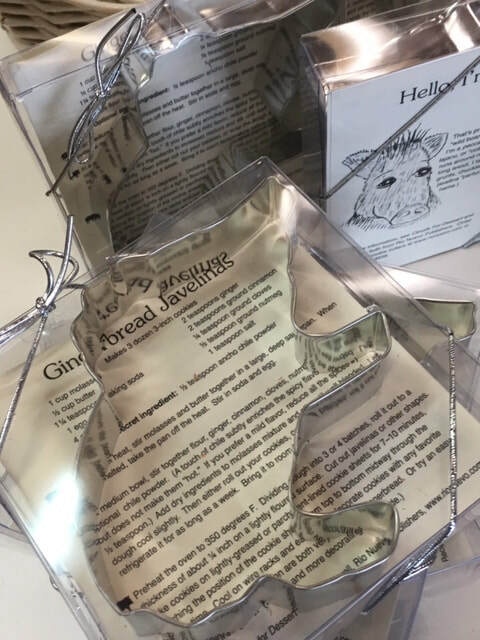 All proceeds from the Gift Shop sales directly benefit our programs. 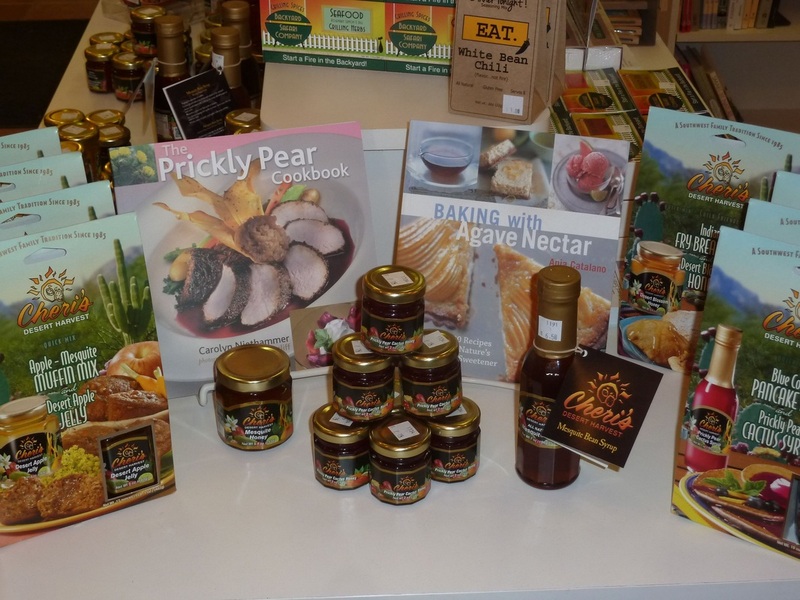 The Gift Shop offers a tasty assortment of sweet treats ranging from Prickly Pear Jelly to Cactus Flower Honey to Agave and Prickly Pear Syrup. This locally produced salve harnesses the healing properties of creosote bush, a common desert plant also known as chaparral, greasewood, and gobernadora del desierto. 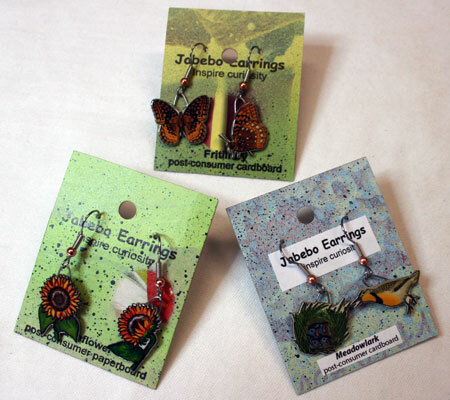 ​Created from recycled cereal boxes (box labels are visible on the backside) each pair of earrings represents a companion set of critters, for instance, a robin and her nest, a male and female painted bunting, a mama and her baby javelina. These are definite conversation starters. ​No more need to add plastic bottles to the landfills. These light-weight, stainless steel drink bottles have a wide-mouth opening which makes it easy to drop in an ice cube or two. Plus, it comes with a handy carabiner clip. 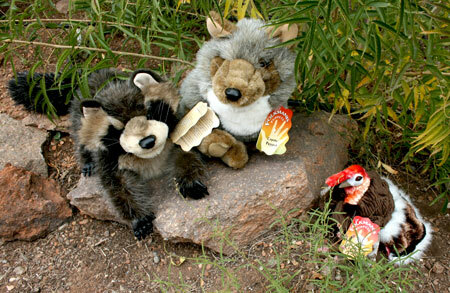 The Gift Shop offers life-like plush stuffed toys by Wildlife Artists, as well as Folkmanis hand puppets and finger puppets representative of animals that live in the Chihuahuan Desert. 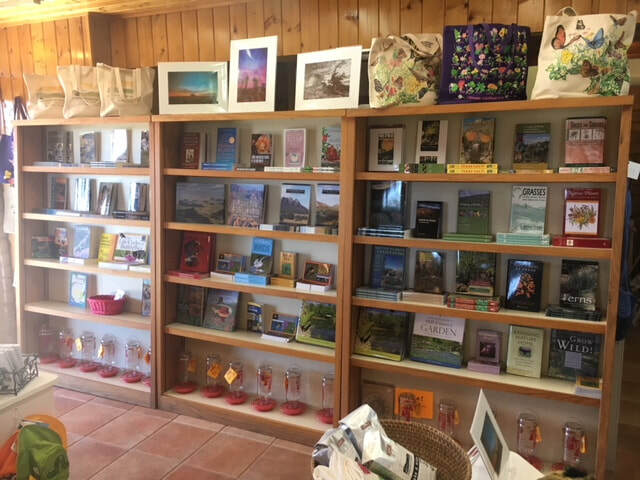 We offer a large selection of books with topics ranging from cacti to woody plants to identification of grasses, bird identification, mammals, reptiles, and a general overview of the Chihuahuan Desert and the geology of West Texas. 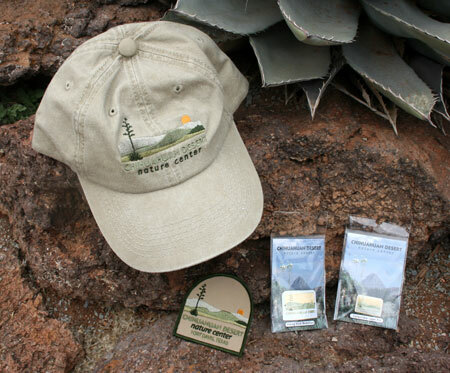 ​Take home a souvenir of your visit to the Nature Center with an embroidered cap in khaki or denim color, patch, lapel/hat pin, decorative magnet, walking stick medallion, or a brightly colored bandanna. We also have CDRI SPF-15 lip balm. ​These are just a few of the many children's books that will capture the imagine of both children and adults. Our CDRI logo tees are a big hit with their "Take a Hike" message on the back! Plus we have our "Bird Dog" and "Hiking is Cheaper Than Therapy" tees. 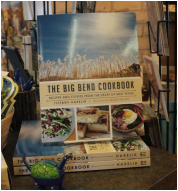 Not only is this a great cookbook, it's also a look at the landscape and culture of the region with its interviews with the folk who make the Big Bend area their home. This makes a great gift, plus you'll have to get one for yourself--after all, you don't want to be left out. 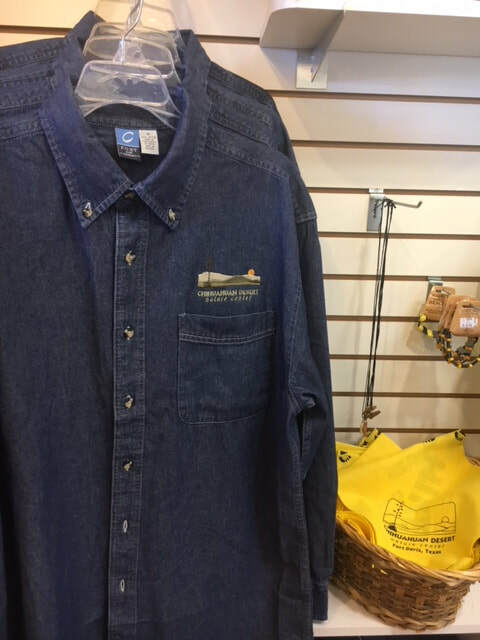 ​Our wildly popular, long sleeved, denim shirt, is 100% cotton with the Chihuahuan Desert Nature Center logo embroidered over the pocket. We also have 100% cotton logo bandannas in bright yellow. ​Over-sized, 100% cotton dish towels make great gifts for all of your friends back home. 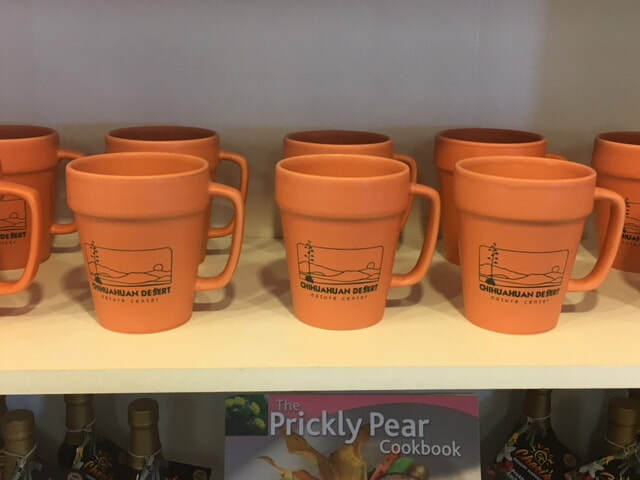 Our terracotta flower pot mugs are great reminders of your visit to the CDRI Nature Center. Dried sotol stalks are surprisingly sturdy and lightweight. 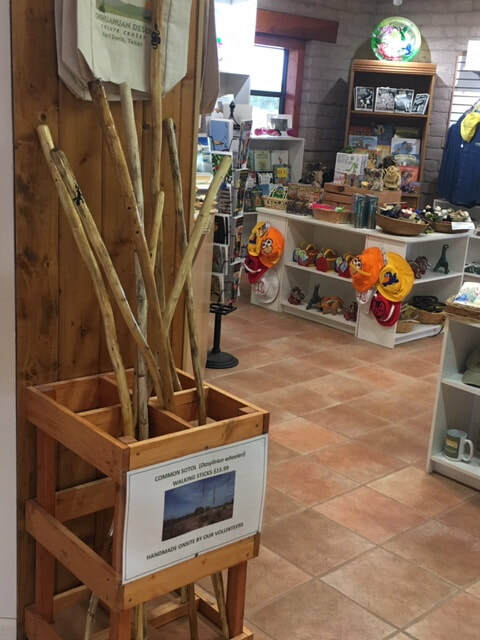 Our walking sticks are lovingly hand-crafted by our volunteers. 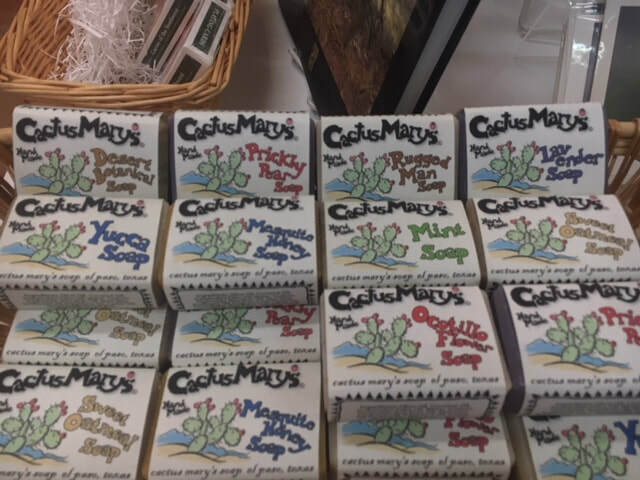 ​Crafted in El Paso, these handcrafted soaps feature scents taken from the desert. Ocotillo Flower, Prickly Pear, Yucca, and Desert Blossom are among the many popular fragrances. ​Our visitors just can't get enough of these mugs. These make a nice remembrance of your visit to the "Best Rural Nature Center in Texas." ​Fresh, ground coffee from Marfa's Big Bend Coffee Roasters is a crowd favorite.